English history is littered with consorts of our monarchs. The vast majority were women, with the occasional man included where the monarch is female. But there were a few women who, were it not for circumstance, would also be included in the Consorts list. To pacify his antagonistic neighbour, Fulk V of Anjou, Henry I of England has his only legitimate son, William Adelin, marry Fulk’s daughter Matilda in 1119. Matilda never got to wear the consort’s crown though, in November 1120 the ship carrying William from Normandy to England crashed and sank, one of the many victims was William himself. Henry was suddenly without a legitimate male heir, and Matilda was without a husband. She spent a few years living in her father-in-laws court before returning home. Rather than remarry she chose to join the convent at Fontevrault, where she eventually became Abbess. In 1172 Margaret of France was married to Henry, eldest son of Henry II and Eleanor of Aquitaine. 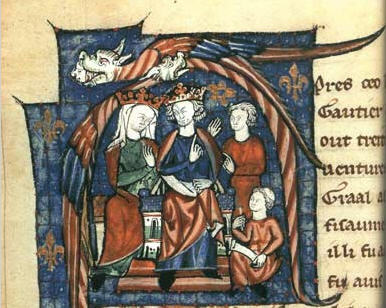 Henry’s father had already crowned his son joint-king in a system similar to that in France, which led to him given the title “Henry the Young King”. Margaret herself was crowned at Winchester Cathedral on her wedding day, but given that her mother-in-law was still very much alive and very much Queen of England, Margaret’s title was even more honorific than her husband’s. Margaret gave birth to a son in Paris in 1177, but the boy died within hours and she and Henry never conceived another child. Her “reign” as Queen of England came to an end when Young Henry rebelled against his father and died, leaving his brother Richard as heir and Margaret a widow. She went on to marry King Bela III, and became Queen of Hungary. In the on-going attempt between England and France to find some peaceful middle-ground that would allow both sides to stop fighting each other, Margaret’s younger sister Alys of France was betrothed Prince Richard of England, and sent to England to grow up in the court of Henry II and Queen Eleanor. She didn’t expect to become Queen, Margaret would get that title, but as the wife of the King’s brother she would expect wealth and a degree of influence. But Young Henry died before he could become King, leaving Richard as his heir and Alys now potential Queen of England. Instead, Richard repudiated her and married Berengaria of Navarre. Chroniclers at the time said that Alys had been seduced by Henry II and given him an illegitimate child but that may have been put about as propaganda by Richard as an excuse for jilting her. She was also offered to Prince John, but the match was declined, and in the end Alys was married off to the Count of Ponthieu, rather a large step-down from Queen of England. An heiress in her own right, Mary was married to Henry of Bolingbroke, son of John of Gaunt. As John’s eldest surviving son Henry was due to inherit the very wealthy Duchy of Lancaster estates, which would have increased with Mary’s own inheritance. They married in 1380 when Mary was only twelve. After a wait of several years the couple had six children in eight years. After his father died Henry’s lands were stolen from him by Richard II, leading him to rebel and take the throne himself as Henry IV. Sadly though Mary never saw her husband become King as she died in 1394 after giving birth to her sixth child. She gave Henry his heir, who became King Henry V, but it was Joan of Navarre that got the crown. Joan of Kent had a scandalous early marital history. After growing up in the Royal household she married William Montacute, heir to the Salisbury Earldom. Several years later Thomas Holland returned from abroad stating that Joan had married him before he left, and he wanted her back. The Pope annulled her marriage to Montacute, and she was sent back to Thomas Holland. By 1360 she was a widow with five children, and she created another scandal by secretly marrying The Black Prince, the heir to the English throne. Edward III was furious, but had to accept the marriage and held the appropriate celebrations. Joan then spent several years in Gascony with her husband. In 1371 Joan returned to England with an ill husband and their son, Richard of Bordeaux. The Black Prince died in 1376, predeceasing his father the King, leaving Joan as nothing more than the widowed Princess of Wales. When her son Richard became King Richard II on his grandfather’s death, the crown and the title “Queen of England” went to Anne of Bohemia.